Schnauzers are known for their unique appearance, fierce loyalty, and high intelligence. With their furry beard's and arched eyebrows, these dogs have a look that appeals to owners and show judges alike. Despite their old-fashioned appearance, Schnauzers are lovable and energetic pups that are always on the move. Originally from Germany, Schnauzers were bred as work dogs. They were eventually bred into the three variants we know today. Whether you own a Miniature, Standard, or Giant Schnauzer, nutrition is key to living a happy and healthy life. To keep up their active lifestyles and avoid common health issues, Schnauzers need to consume foods filled with high-quality ingredients. Throughout history, these pups were bred to chase cattle and protect the herd. 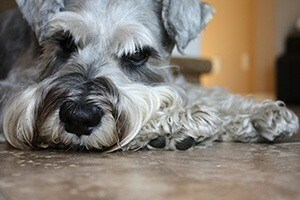 Much of that drive and energy remains in modern Schnauzers even if they're simple house pets. On average, dogs of this breed need at least a full hour of exercise each day to stay healthy. With that much exercise comes a need for plenty of fuel. The exact amount of food your dog will need depends on a number of factors. Not only does their weight need to be considered, but so does their activity level. It's important that you monitor their activity throughout their lives and adjust their food intake accordingly. Food should be measured out in calories instead of volume, as different foods contain varying levels of nutrition. It's also good to include treats in their daily intake to avoid weight gain. 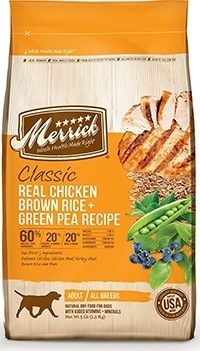 This dry kibble from Merrick is made from healthy ingredients that aren't sourced overseas. Everything is wholesome and the mix is free of byproducts and chemical preservatives. The formula contains 30 percent protein and 15 percent fat. The main source of protein is deboned chicken. Complex carbohydrates like barley and sweet potatoes are also included for lasting energy. To help fight joint and skin issues, the formula contains omega fatty acids, chondroitin, and glucosamine. Plenty of leafy greens and fruits are also thrown in the mix to provide your pup with a healthy dose of vitamins and nutrients. 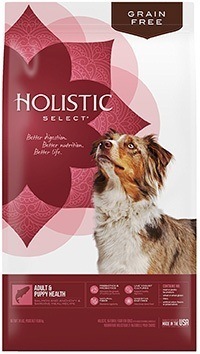 Designed to help keep your dog's overall health in check, this dog food[ provides a complete and balanced diet. It contains natural digestive enzymes and plenty of fiber to help your dog avoid stomach issues. There's also prebiotics and probiotics to promote gut bacteria growth. The main sources of protein are salmon, anchovy, and sardine meal. As a result, the formula is chock full of omega fatty acids and antioxidants. It's completely free of grains, artificial preservatives or colors, and unhealthy fillers. From the famed chef Rachel Ray is this healthy dog food option. It's a nutrient-dense kibble that contains wholesome ingredients that cater to your dog's needs. It uses real turkey, duck, and quail as the main sources of protein. In total, the protein makes up approximately 30 percent of the formula. When it comes to carbohydrates, the food utilizes complex variants like peas and sweet potatoes. The food is naturally free of gluten, so it's easier on your pup's digestive system. 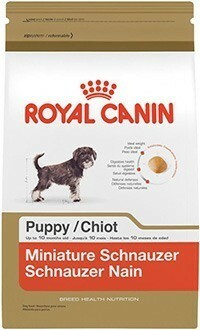 This dog food is carefully crafted to meet the needs of Miniature Schnauzers. It contains 29 percent protein and 12 percent fat. The included ingredients help to support digestive health by encouraging the growth of intestinal bacteria. There's also a number of ingredients that can help tackle breed-specific issues. Omega fatty acids and antioxidants work to keep the skin and fur healthy while also improving the immune system. Even the size and shape of the kibble are specially designed. They are smooth and round to help Schnauzers grasp onto it and chew. Another option for smaller Schnauzers, this dog food is designed to help dogs under 25 pounds live long and healthy lives. Natural ingredients are used throughout. The mixture is free of artificial ingredients and potentially harmful byproducts. Chicken meal is used for protein. It also contains carrots to help with eye health, spinach for fiber, and whole grain wheat as a complex carbohydrate. The formula also has antioxidants, Vitamin C, and Vitamin E to improve their immune system and help increase their life expectancy. These pups can be very voracious eaters if left up to their own devices. It's important that you avoid free-feeding. That freedom with kibble can be detrimental to Schnauzers. The breed is susceptible to many health issues that can be agitated if they overeat. The best method is to feed them no more than twice a day. This gives them plenty of time to properly digest their food and avoid eating too much at one time. Puppies typically start weaning off their mother's milk at around seven weeks of age. During this time, it's important that you start implementing a feeding schedule. Within the first few weeks of eating kibble, you can feed them three times a day. However, once they hit the 12-week mark, switch to twice a day. How much Calories do they need Exactly? These small lap dogs only weigh between 12 and 20 pounds fully grown. They can get up to 14 inches tall. Their small bodies will need about 480 calories every day to stay healthy. If they're on the more active side, you may want to bump up their intake to 775 calories. As they get older, you'll want to adjust their food once again. Senior dogs will do well with 390 calories each day. Standard Schnauzers don't get that much bigger than their miniature counterpart. Full grown adults can get up to a foot and a half tall. However, these few inches in additional height does add a bit of weight. Healthy adults can weigh between 30 and 50 pounds. To maintain this weight, average adult dogs will need to consume roughly 1,000 calories each day. Once they get older, their calorie requirement falls down to 800 each day. If the dog works or spends most of their day exercising, they may need upwards of 1,600 calories. The largest of the bunch, Giant Schnauzers need plenty of food to stay healthy. It's not uncommon to see this large variation still working on the farm or running alongside their owners to get exercise. They get a little over two feet tall and can weigh anywhere between 60 and 80 pounds as adults. A typical adult will need 1,680 calories each day. Working dogs may need as much as 2,800. Once they settle down and start getting older, they'll still as much as 1,500 calories each day. The dog food market is vast and plentiful. Unfortunately, not every food option is ideal for schnauzers. They have the same basic nutritional requirements that every breed has. However, Schnauzers are do have unique issues that need to be addressed. It's important that you scan the ingredients list and make sure that you're going with an option that'll help your dog in the long run. Dogs are natural carnivores that thrive off of protein. 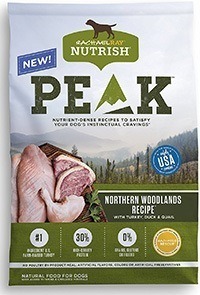 Regardless of what type of dog food you go with, natural protein should be at the top of the ingredients list. Schnauzers can benefit from a dog food that contains a few different protein sources. This gives them variety and plenty of amino acids. Foods with a higher percentage of protein are always recommended, especially for active dogs like Schnauzers. More protein will help with muscle development and maintenance. The best types of protein come from identifiable sources. These include chicken, beef, bison, fish, and much more. Meat meals are also acceptable. They refer to meat that's been ground up. One thing you should avoid is byproducts. These ingredients are often used in cheaper foods to save on production costs. They may contain animals from questionable sources. As a good rule of thumb: stick with foods that have ingredients you understand. 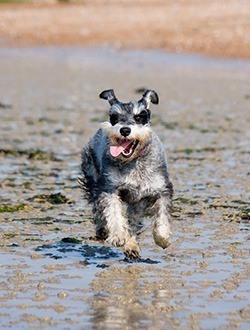 Schnauzers need a healthy dose of fat in their diet to stay active and healthy. Fat plays an important role in the food's overall taste and appeal. It's a healthier alternative to synthetic flavors. Not only that, but fat also acts as tiny morsels of energy. They help to kick your dog's metabolism into gear and allows them to stay energetic throughout the day. Many manufacturers will stick to fat that comes from the main protein source. You should look out for named fats like chicken fat or fish oil. Fish oil is a particularly useful ingredient to Schnauzers. Fish oil contains omega fatty acids. They can help to keep your pup's skin and coat healthy for many years to come. Beyond that, consuming certain types of fatty acids provides health benefits as well. DHA is an omega-3 fatty acid that's been known to help with eye and brain development in puppies. Other oils, such as flaxseed and coconut, contain medium chain fatty acids. 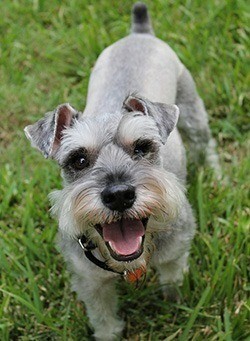 They can help Schnauzers retain their vitality and energy as they get older. Carbohydrates help to provide your Schnauzer with energy. While many dog owners often avoid carbohydrates, it's an important part of a Schnauzer's diet. However, it's important that you go with complex carbs. These include sweet potatoes, peas, oats, barley, and much more. Complex carbohydrates have a lower glycemic index, so they help to provide your dog with high levels of energy throughout the day rather than spikes. While it is important for Schnauzers, carbohydrate consumption should be moderate. You should avoid simple carbohydrates like corn and soy. Not only do they burn much quicker, resulting in an energy crash, but they can also be tough on your canine companion's digestive system. They're often included in cheaper foods and act more as a filler than anything else. Dogs need fruits and vegetables much like humans do. They're a source of vital vitamins and nutrients. They contain the building blocks needed to help your dog develop physically and mentally. They can also help fight off damage caused by free radicals, improve your pup's immune system, strengthen their bones, and give them the fiber they need to keep their digestive tract in check. Schnauzers are susceptible to a number of health concerns. While not every dog will experience these problems, it's important to be wary of them. Some conditions can be prevented or made less severe with a healthy diet. Issues like cataracts and retinal atrophy are more prevalent in Miniature Schnauzers. Their eyes can begin to cloud, affecting their vision. In some cases, they may even go blind. One of the best ways to avoid these problems is to keep their bodies at a healthy weight and condition. Symptoms can occur when a dog becomes overweight or suffers from diabetes. A diet rich of antioxidants and vitamins can also help to maintain overall ocular health. This condition can affect all size classifications of the Schnauzer breed. Dogs suffering from the condition have low thyroid functionality, which results in tiredness and poor mental focus. Vegetables and fruits have been known to help treat the condition. This is because they contain natural Sterols. The organic steroids are found in many plants and seeds. Most common amongst Giant Schnauzers, hip dysplasia is a painful condition that affects the dog's joints. The connective tissue in the hip can't hold the joint in place. It manifests itself in limping and difficulty getting up. To help alleviate the pain, you can supply your dog with a diet full of omega fatty acids, chondroitin, and glucosamine. They strengthen the bones and connective tissue in the body. This a condition that only plagues the Schnauzer breed. Nicknamed "Schnauzer Bumps," symptoms include black crusty bumps on the dog's back. It can eventually lead to hair loss. To combat it, feed your dog plenty of healthy fats. Fish oil with omega fatty acids can keep your dog's skin and hair supple and in good condition. 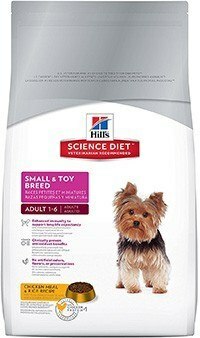 The Best Dog Food for Shetland Sheepdogs?